Still, it’s difficult to be too put off by this cover version. 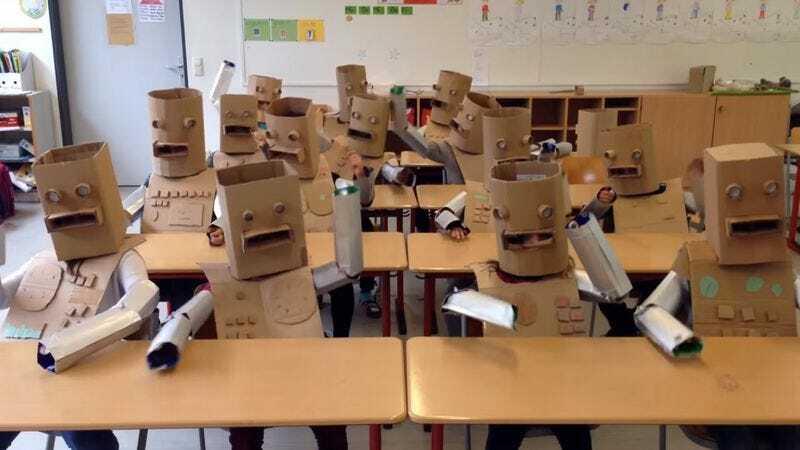 After all, the Halloween-appropriate video features 16 kids in adorable homemade cardboard robot costumes, all of which are definitely the products of human hands and not machine-made in the slightest. Besides that, even though the song may be about mindless obedience (the translated English lyrics contain the couplet: “We are programmed just to do / Anything you want us to”), the kids in this video are still kids. One little unruhestifter in the second row even does some unscheduled choreography, for which he is apparently scolded at the song’s conclusion. The music, too, is appealingly human in its imperfection, eschewing the cold precision of the original Kraftwerk recording in favor of something that sounds like a campfire sing-along.